Only 2o minutes from San Francisco! Belly Dancer of the Year has relocated this year to the beautifully retro Hillside Club in Berkeley, California. The stage has a black backdrop, wings, theatrical lights, and a lovely curtain. There is a green room at stage right, and a downstairs dressing room with lighted mirrors. Seating capacity is 200. Additional photos and stage dimensions coming soon. 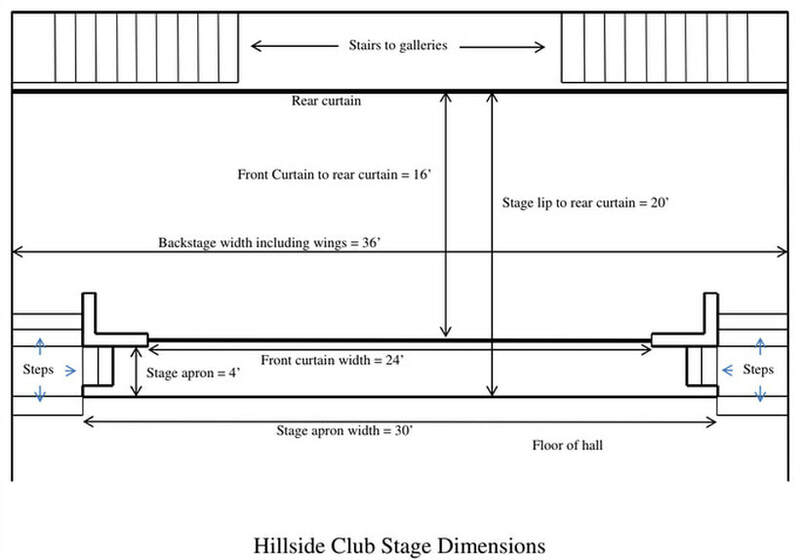 Hillside Club is .8 mi from the Downtown Berkeley Station at 2160 Shattuck Avenue. .25 mi after exiting the Caldecott Tunnel. Bay Area traffic is unpredictable! park in a restricted area. Do not leave anything in your car. There is plenty of well lit and free street parking around Radiance. Please do not leave any valuables in your care. We can recommend several local restaurants. Chop Bar and Nido are are within a couple of blocks. There are also several restaurants in Jack London Square - which is a bit further but still easily walkable - including Forge, Lungomare, Scott's, Yoshi's, and Kincaide's. If you're up for a short drive, Oakland's Uptown and Grand Lake areas have lots of tasty eats.